Calle... Riva... Ruga... Fondamenta... Rio Terra... Salizada… All you really need to know is that these are all different words for "street". But, Venetian street names do tell you a lot about where you're going. 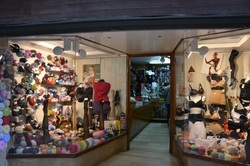 "Sotoportego" means that the street continues beneath a supported structure. In most instances you can walk under a sotoportego and come out the other side. A Fondamenta is a street running alongside a canal. A "Rio Terra" is a street that once was a canal. As you walk, you will find that the street names change quite frequently. You may even notice that the street name is spelled differently on different ends of a street and differently again on your map. Keep walking and enjoy! Drink The Water. 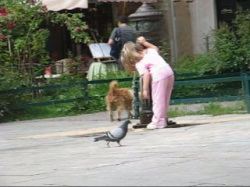 There are more than 100 public water fountains in Venice. You can drink the water. 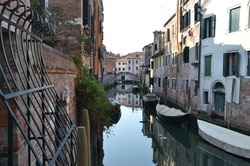 The Commune di Venezia has been actively campaigning to promote drinking of the city tap water as a means of reducing pollution from plastic bottles. To save money, bring your own bottle and fill up at fountains around town! 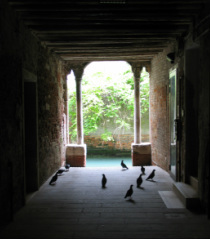 Find the fountain nearest you with "The Other Map Of Venice". Trick: If you are going to buy bottled water, keep in mind that buying it in a grocery store is much less expensive than getting it in a bar or cafe. To give you an idea: A two liter bottle of water typically costs less than 50 cents in a grocery store, while ½ liter will cost more than 1.50 euro at a bar. Packing for Venice? Don't overdo it! Remember that whatever you bring to Venice, you must be able to carry over bridges, hoist in and out of boats and carry upstairs. For six weeks in Venice, I pack two carry-on sized pieces of luggage: A wheeling duffle and a wheeling backpack. When I get to town, I can put my pack on my back and thus only have to carry one bag over the bridges. 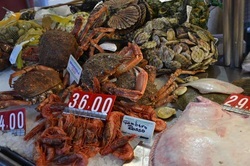 In Venice, the prices of vegetables, meats, cheeses and breads are quoted by the kilo. A kilo is the equivalent in weight to 2.2 lbs. Don't worry! You do not have to buy 2.2 pounds of everything. It is customary to order food stuffs in increments of 100 grams. 100 grams is equal to about 3.5 ounces. Where is everybody? Many businesses in Venice will be closed for a few hours in the afternoon for "Siesta." Siesta can last for two or three hours, either from 12 or 1 until 3 or 4 for a business, and from about 3 to 6 for a bar. It's a relaxing tradition once you get used to it. But, it can also be a big culture shock for those of us who are accustomed to run our personal errands during exactly that time! The hours of siesta vary by business, but are always in the afternoon. To avoid frustration, plan on running your errands in the mornings or evenings during your stay in Venice. 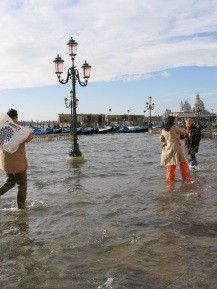 Acqua Alta (high water) is the term used to describe high tides in Venice that rise above street level. 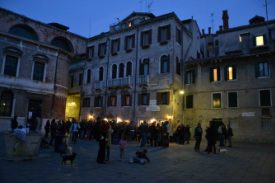 When there is going to be Acqua Alta, the city sounds an alarm to warn residents and visitors. Acqua Alta lasts a few hours and elevated walkways will be constructed in some parts of the city. Though recent years have seen record levels of flooding, life in Venice does not stop because of Acqua Alta. Rather, you will see people working, shopping and visiting cafes…All in rubber boots that come up above their knees. Find lots more tips & tricks in our blog!